Infrared Narrow Band Filters are designed for the detection and measurement of atmospheric gases. Many gases show a specific absorption line in the mid to far infrared range. With a filter which allows the monitoring of this specific gas absorption, the measurement of gas concentration is possible. Technology is based on infrared (IR) absorption of radiation called the NDIR(Non – Dispersive Infrared) technique. 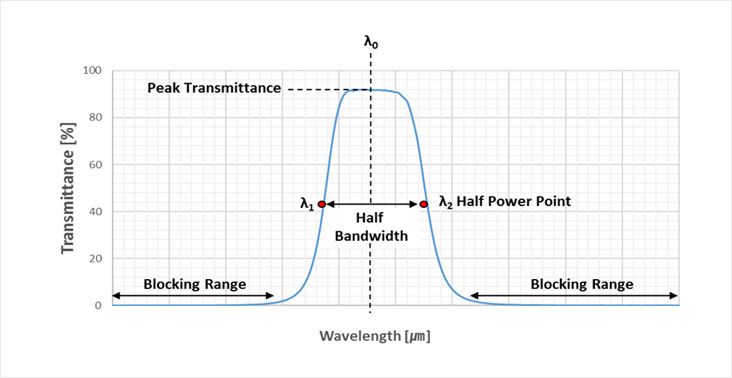 By detecting the amount of light absorbed, within just a narrow band width that coincides with the resonance wavelength of the specie selected, one gets a measure of the number of molecules, free from interference of other species.